1. Pour the milk into a wide, heavy-bottomed pot and place over high heat. Add the sugar. Bring to a boil and then lower the heat so that the milk boils steadily but without rising. Stir now and then so that the milk does not stick to the bottom of the pan. 2. When the milk thickens, stir very often and towards the end stir constantly, preferably using a wide wooden spatula. 3. Continue cooking until all the burfi pulls away from the pan and is very thick. This takes practice to know when to take it off the heat. It stiffens more as it cools. Transfer it to a buttered plate to cool. 4. When cool enough to handle, pat into a cake or roll into balls. 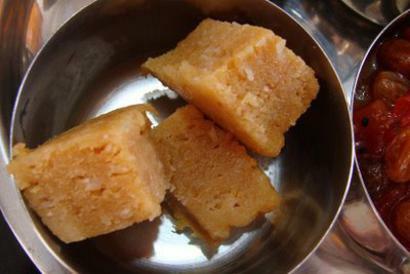 It helps to moisten with a little water a spatula to pat the burfi down smoothly into a cake. When thoroughly cooled, cut the cake into squares.